Switchgrass is a perennial crop alternative for biofuel production on marginal land in the U.S. Cornbelt. Estimating change in worker injury risk moving from corn to switchgrass production would be helpful before major production changes occur. Safety risk assessment in agriculture has been limited for whole production systems and across regions. A comparative risk assessment model between corn and switchgrass has been developed that makes use of limited agricultural injury data. The assessment uses published USDA and Bureau of Labor Statistics (BLS) data along with Midwestern U.S. data on injuries with various pieces of farm equipment. The model develops a probability distribution of agricultural worker exposure to specific machines and processes, and couples this with a probability of injury distribution relating to specific machines. A more complete description of the modeling method is in Ryan et al., 2016. Probability of exposure is developed by Midwestern state and enterprise (corn or switchgrass) from USDA Ag Census data using acres of corn or grass crops (e.g. hay, grass forage). Probability of injury is developed from state and enterprise (corn or switchgrass) injuries and the number of farms, assuming one worker (farmer) per farm. Comparing a perennial crop (switchgrass) to an annual crop (corn) requires a multi-year evaluation, in this case ten years (equaling the assumed life of a switchgrass planting). Exposure scenarios during production are divided into establishment/seeding (March – May), mid-season management (May – September; e.g. pest control), and harvest (September – November). Although corn is planted and harvested each year, switchgrass is planted the first year with an assumed replanting activity of 50% of the area the second year. 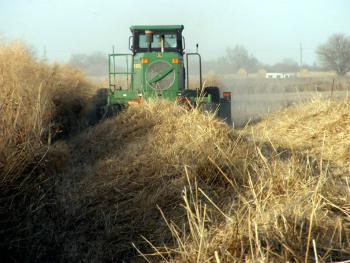 Switchgrass harvest begins with an assumed harvest of 50% of the area during the second year, but harvest of 100% of the area thereafter (years 3 – 10). Injuries by agricultural machine type and month have been reported by Gerberich et al. (1998) for several Midwestern states. Gerberich et al. reported 83.44% of total annual injuries occurred during the March – November period, the period of interest for establishment through harvest. Distribution of injuries by machine type (e.g. planter, combine, baler) were calculated as a percentage of all agricultural related injuries by state for specific years. For total injuries, BLS agricultural injury counts (1996 – 2011) were selected as most consistent and representative data available. These annual statewide counts were multiplied by the injury distribution percentage by machine for individual states (i.e., Indiana planter, Wisconsin baler) to obtain a range of injuries due to various machines in various states for various years. Probability of injury for any combination of machine type by state and by year, equaled the number of injuries divided by the number of exposed workers to that machine operation. Total exposed workers equaled the number performing that operation in the state that year (as based on USDA Ag Census data, assuming one worker per farm and allocating machine operations to various crops). Individual machine operations were placed within the appropriate exposure scenario (establishment, management, or harvest) to group machine activities rather than imply precise measurement of risk with any single machine. The combination of estimated probability of injury and probability of exposure from a range of years and locations (states) allows use of a stochastic (Monte Carlo type) simulation model to capture the range of risk considering all possible values of year, location, and machines across the Midwestern U.S. for which data are obtained. Random chance was used to select various combinations and calculate worker injury risk (likelihood of injury given that exposure to a machine hazard has occurred) for 500,000 runs, each over a 10-yr period, using the exposure and injury data developed for the model. A frequency distribution of worker risk for establishment, management, and harvest was constructed to identify the greatest contributing factor to worker risk in each system as well as the comparative overall risk difference between switchgrass and corn production systems in the Midwestern U.S. Figures 1 and 2 show frequency distributions of worker injury risk, respectively for corn and switchgrass production, during establishment, management, or harvest periods from 500,000 runs of randomly selected exposure and injury data across years and locations. Fig.1. Worker injury risk frequency distributions for corn establishment, management, and harvest operations. Fig.2. 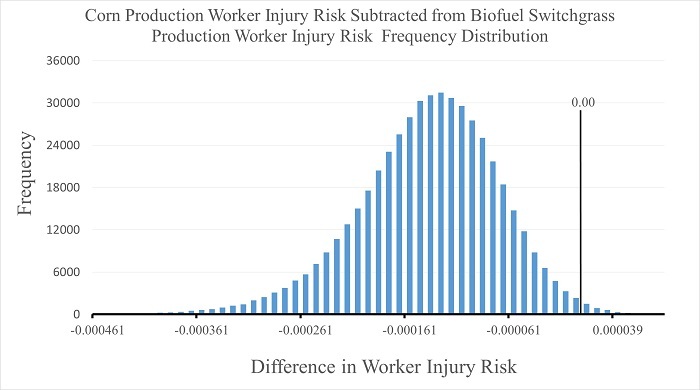 Worker injury risk frequency distributions for biofuel switchgrass establishment, management, and harvest operations. Harvest activity has the greatest worker injury risk in both corn and switchgrass enterprises with a mean risk for injury during the ten year life cycle of 137 per 100,000 workers for corn and 101 per 100,000 workers for switchgrass. Establishment (tillage and seeding) is the next greatest risk for worker injury in corn as it is seeded and established each year. Conversely for switchgrass production, worker injury risk during establishment is lower than risk during the management period as seeding occurs only the first year and again partially the second year. Management occurs each year during the ten-year life cycle of annual corn and has a smaller worker injury risk than harvest and establishment. The comparative risk of worker injury for switchgrass production as compared to corn production summing all three exposure scenarios of establishment, management, and harvest is shown as a frequency distribution of all 500,000 runs developed from random combinations of years and locations. Injury risk was less for switchgrass production in 99% of the cases (i.e., runs). Fig.3. Difference between switchgrass and corn worker injury risk frequency distribution for 500,000 variations of years and location. Injury risk was less for switchgrass production. Limited data are available to estimate agricultural worker injuries. A probabilistic risk assessment model to estimate worker injury risk has been developed using USDA and Bureau of Labor Statistics (BLS) data of farming operations and worker injuries. Data imply harvest is more prone to injury risk than crop establishment or mid-season management activities. Annual corn production is estimated to have greater injury risk than perennial switchgrass production, in part due to annual required seeding establishment. Gerberich, S. G., Gibson, R. W., French, L. R., Lee, T., Carr, W. P., Kochevar, L., Renier, C. M., & Shutske, J. (1998). Machinery-related injuries: Regional Rural Injury Study—I (RRIS—I), Accident Analysis & Prevention, 30(6), 793-804. Ryan, S. J., Schwab, C. V., and Mosher, G. A. (2016). Comparing worker injury risk in corn and switchgrass production systems: Results from a probabilistic risk assessment model. International Society of Agricultural Safety and Health. Paper no. 16-03. Next PostNext Research Summary: What Would it Take to Convince Farmers to Grow Switchgrass for Biomass?